We wouldn't go as far as saying it soured the night overall but the minute's silence at the Aviva yesterday was far from an ideal way to start the game. It was only a minuscule section of the Bosnia fans but nonetheless, given the magnitude of the occasion, it was heard far and wide. The reaction was one of disgust and rightly so. In a crowd situation like that, it's very difficult for one lone voice not to be followed by others, eventually that escalated with the disgust of the rest of the crowd and it became particularly notable. It shouldn't have happened but to suggest it was anymore than a tiny section of idiots at fault for it would be wide of the mark. Which is why Limerick GAA vice-chairman, Liam O'Sullivan, has been getting quite a bit of criticism for this opinion which was shared last night. Safe to say, with something that contentious, there were quite a few dissenting voices. However, O'Sullivan was certainly standing over his comments. O'Sullivan suggested that the 'that soccer crowd' part of the statement was being taken out of context but others were less than convinced of that. 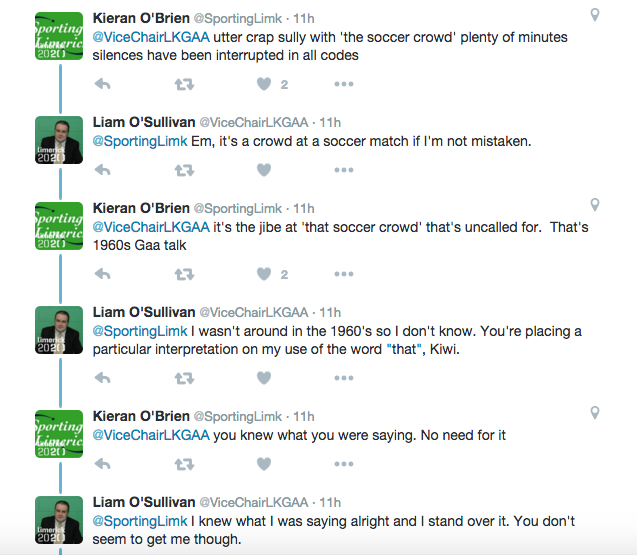 @ViceChairLKGAA why the need to say "that soccer crowd" when crowd would have been more than sufficient? 'Ill-advised' might be the best way to describe his particular wording of the original tweet.